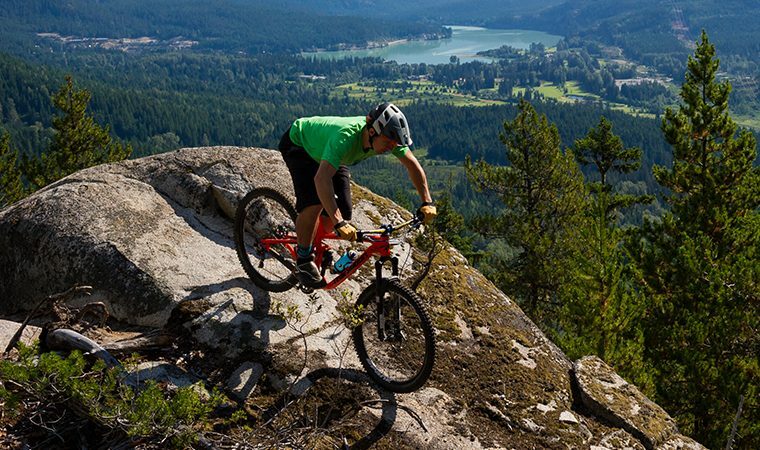 Over 190 km (120 miles) of beautiful coastal trail lies outside the Whistler Bike Park, ready for you to explore. From sweet and easy to technical and gnarly, Whistler boasts an incredibly diverse network, easily accessible right from the village. And for those adrenaline junkies looking for gravity assisted, chair lift-accessed descents, there is always the world renowned Whistler Bike Park for you to dig your heels into. The Valley Trail is a 40 km paved pedestrian/bicycle trail that links parks, beaches, neighbourhoods, and playgrounds to Whistler Village. It runs from Cheakamus Crossing to Green Lake and Emerald Estates. It is popular with cyclists, strollers, walkers, dogs, and families. It’s the perfect place to go for a gentle ride with the family and cruise to the lakeside beach for a swim and a picnic. For the more adventurous biker, there is also technical singletracks, the Lost Lake trails and hundreds of miles of networked trails through old growth forest to choose from, all within minutes from the Whistler Village. So after a day of riding runs like Emerald Forest and River Runs Through It, you can easily find your way back to a Village patio for a refreshing drink. The trails are well signed and offer challenges and excitement for intermediate to advanced riders. Please visit our Whistler Bike Park page for more information about Whistler’s Bike Park, rentals, and lessons.